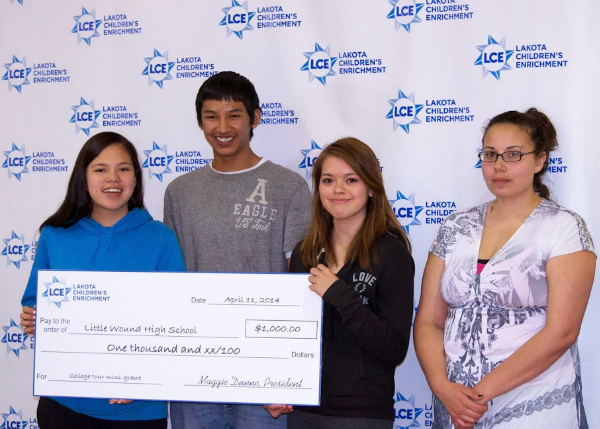 Little Wound High School Receives Grant for College Tour! Three of the students from Little Wound School who will be touring colleges with #TFA teacher Kiva Sam this Spring. We met Teach for America’s Kiva Sam last August, when she participated in a panel discussion at our First Game Changers Youth Summit. Originally from Kyle SD, Kiva is now teaching at the Little Wound School, in Kyle. A graduate of Dartmouth College, Kiva wanted her students to understand the importance of higher education and to see that despite the high drop out rates on Pine Ridge, youth across the country are excited to learn and to continue their studies. Kiva’s proposed agenda includes — time permitting — visits to the University of Pennsylvania, Columbia University, Dartmouth College and Harvard University. Under her proposal, the team will stay at hotels and see the local sights at each place they visit — an important part of any trip to any new location. In order to help get Kiva’s online fundraising rolling, Lakota Children’s Enrichment agreed to match the first $1,000 donated online towards the trip! At the Writing Challenge Award ceremonies held at the Little Wound School on April 11, Kiva and some of her students accepted an oversized $1,000 check and the students spoke about how much the trip means to them. 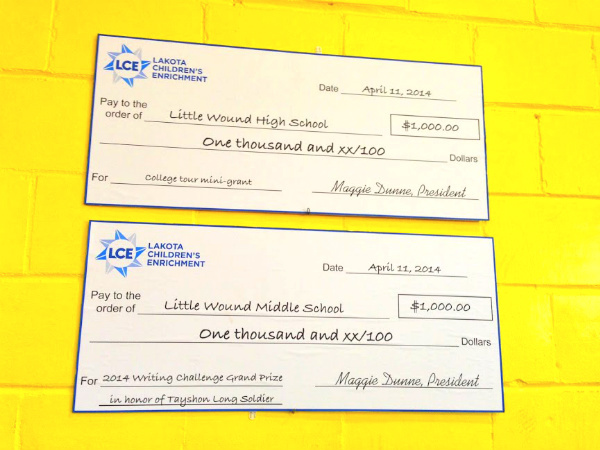 This $1,000 grant was separate and above the $1,000 grant that the Little Wound Middle School won through LCE’s VOICES OF THE LAND Writing Challenge. You can watch Kiva’s August 2013 message to youth at our first Game Changers Youth Summit on our Video Page.